It was 2009. I was 16 years old. Which seems like a lifetime ago, but in reality it was only four years in the past. My Mum pushed a newspaper over to me across the table, pointing at one heading in particular; "Auditions for a production of West Side Story". I immediately scanned the rest of the ad and saw they took place that weekend, in town. I got butterflies at the thought of what this could lead to, because being in a show, on an actual proper stage had always been a dream of mine. I'd always thought it would be that, just a dream. But here was a chance to make it happen. I remember heading there with my Mum and Dad for emotional support. I remember exactly what I was wearing. I remember exactly what I sung - Feed the Birds from Mary Poppins - and I remember the "awwww" some older member gave when I told them said song choice, along with my age. It struck me that I was probably the youngest person there, and might not have the best chance at getting in. Looking down the line of the ten people I would audition alongside, I could tell they were all much older, and probably more experienced as a result. But I sung my heart out anyway. I threw myself into rehearsals. Every Wednesday and most Sundays, I was Puerto Rico-ing it up as a Shark ('mon the Sharks). Even though I wasn't in many scenes - OK, I was on a rota to sit on a bin for America - I loved every second I spent at Apollo. Show week was just as amazing and magical as I had always imagined, I honestly cannot describe the feeling of being on stage, putting on this spectacle, and having people cheer for you, for you and everybody else's talent. 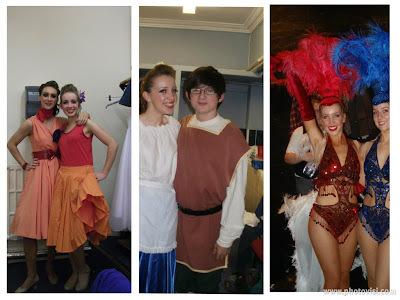 I went back and did a few more shows with Apollo, a pantomime, then Gypsy (which is actually a pretty crap musical, don't watch it unless you love Bette Midler. Or Stripping. ), and finally Les Mis. This was possibly the highlight of my time there. I finally got some solo lines, I was in the majority of the numbers, and I got praised when I filled in for the principal females when they weren't at rehearsals. The week I spent in East Kilbride Theatre with that cast was just such a memorable and emotional one, I don't think I'll ever forget it. My time at Apollo drew to a close, and after a short dry spell show-wise (mainly due to school exams) I joined The Minerva Company in their production of Anything Goes. Once again, I was a newbie and a relatively baby member of the cast, but I still had a blast. The choreographer recognised I could dance much better than most of the girls well, and gave me the part of an Angel, which meant I got more dancey stuff in a smaller, solo group. Knowing that someone actually appreciates your talent, and makes an effort to showcase it, is quite something. 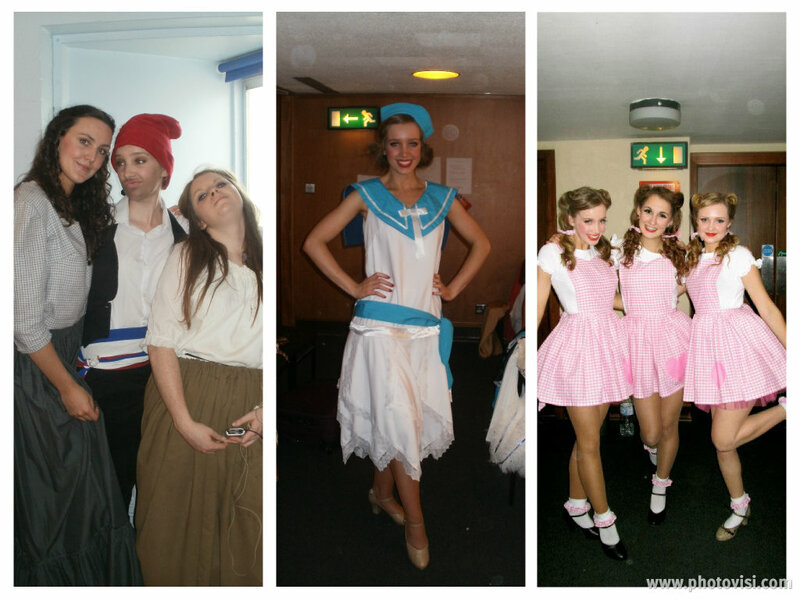 As usual, show week was brilliant and I loved my time aboard SS American. And, finally, I've mentioned it before but my most recent show has been Guys and Dolls with the Cecilian Society at Glasgow Uni. It was everything I've talked about above and more; I got a solo line, was in the special female dance troupe, got snazzy costumes, and just generally had a blast. All of this would not have happened had I not seen that advert in the paper, and I can honestly say my life has completely changed as a result, 100% for the better. I have met some unbelievably talented people, and made some amazing friends who will undoubtedly stay with me for life. I met my first kiss, my first boyfriend, and my current one all through different shows. I've become more aware of my own talents now, and I'm not afraid to admit that I am a pretty good singer, or dancer. I'm more confident in myself. A little more daring and spontaneous too, I would say. Musical Theatre is such an amazing and crucial part of my life now. All because of an advert, and I will always be greatful to my 16 year old self for finding the courage to take it up on its offer.